The use of an “all plans include” section factors a lot of complexity out of the table and allows people to compare plans much more quickly. 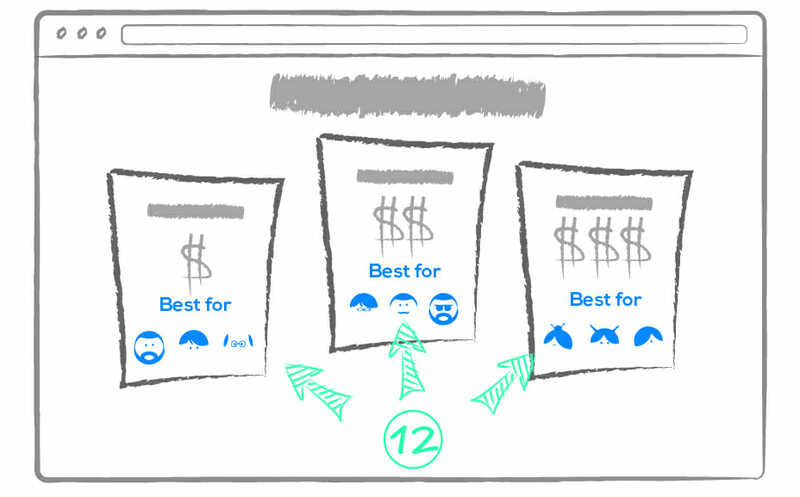 It also provides an area to laud the basic features and benefits that people expect from your product without cluttering the area where you can put forward the features people use to make purchasing decisions.All include sections are visual improvements that reduce complexity and allow for faster decision making.Stripe’s pricing page is an excellent example of this technique. If the lowest level plan doesn’t include a feature, you don’t have to include it with an ‘X’ in the table. Reduce the visual clutter by showing what plans do include and highlighting how plans differ.Reducing complexity allows people to focus on decision making and the specific things on the page that they need to take the next steps. If you have a laundry list of items for each plan, consider an all include section to keep your table clean.I like the way Hubstaff handles this on their pricing page. This is perhaps the most overlooked and most impactful feature. 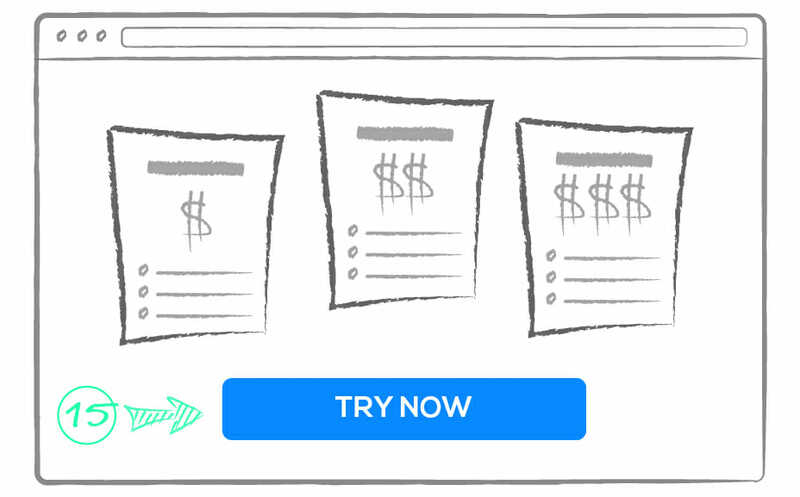 I would usually combine it with another feature and make a CTA for contacting a salesperson, but that won’t make sense for every business.When prospects arrive at the bottom of your pricing page, they were looking for something the didn’t quite find or they are satisfied with their options. These are really the only two options if you look at the fist category broadly enough. We know they are a bit more than garden variety tire kickers because they made it all the way to a decisive page.You may even want to retarget people in the first category, but in any case you should offer them a CTA that meets them at the conclusion of the page. If you can get them started you have a dramatically better chance of converting them to a happy customer. We think ZenDesk’s bottom of page CTA is killer. Trust markers are a broad category of things. 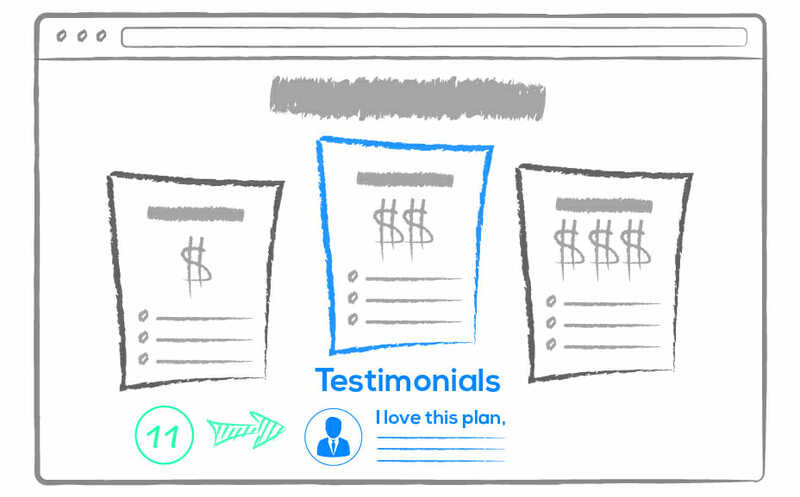 You could include testimonials and other social proof here but we’ve chosen to separate these. The image above highlights published metrics about reliability and social proof in the form of volume statistics, but you could also offer a money back guarantee. These things not only serve to influence people as social proof, but they also can be is the risk reduction category.People will buy when they know, like, and trust you. These trust markers can help like they do for WP Engine. This needs to be below the table and we tend to think it should be last if sales is a common endpoint for your prospects. This is a catch all type of CTA for your customers that don’t understand your pricing or don’t have time to evaluate it. I wouldn’t worry about the “don’t have time” folks. They tend to be the happiest to trade money for time. 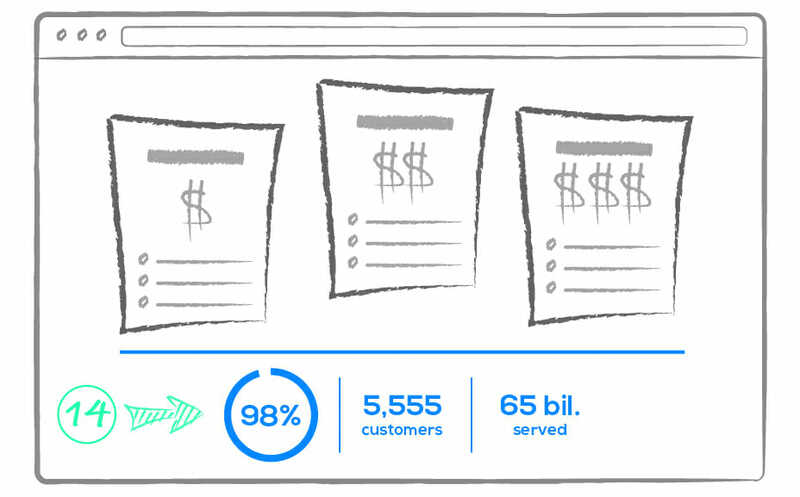 Some industries and segments don’t understand SaaS pricing and self-service models in general. They just want to hear from a human. It’s their ultimate trust check.I may like ZenDesk’s the best, but Basecamp is another example of this technique. 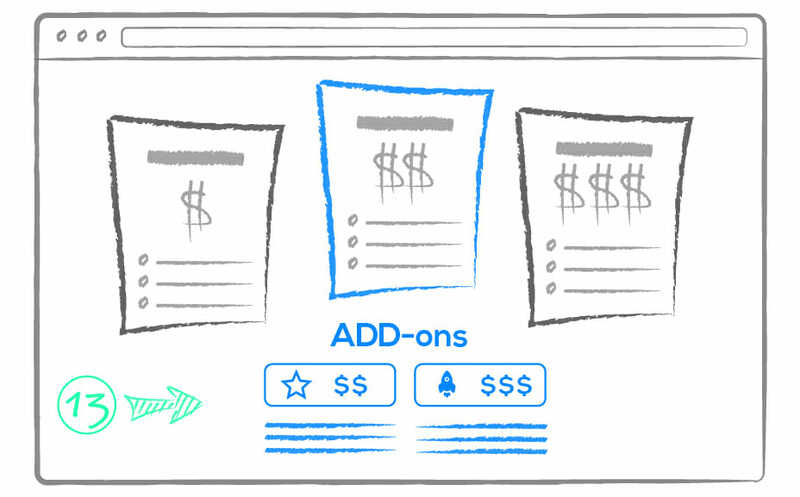 Add-ons are unquestionably the least common of these features for most of the example pages we examined. That said, it’s pretty clear that they are also one of the most impactful as they are essentially the only feature that increases the purchase price.Most products can be complimented by training, onboarding services, related products, information, community access, or warranties. This can improve your customer’s experience as well as their spend. Many customers with larger accounts expect these types of add-ons to be part of the package.KISSmetrics and Hubspot are good examples of this technique. It is extremely common for customers and prospects to have specific questions about billing. Your customer service people should inform you very well on what the common questions are.This is a great place to address billing practices, guarantees, refunds, and if you offer something like pro-rating upgrades.You can often address many of these concerns with a blanket statement about ‘always favoring’ or ‘always being fair’ to the customer. The most important thing to do with this section is allay common fears. 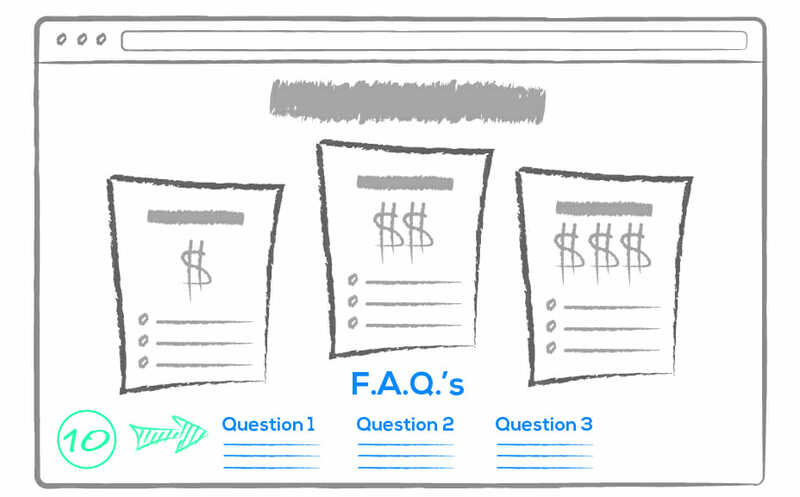 You don’t need a comprehensive product FAQ. Hubspot has a quality example of this practice.